The world looks different at night. 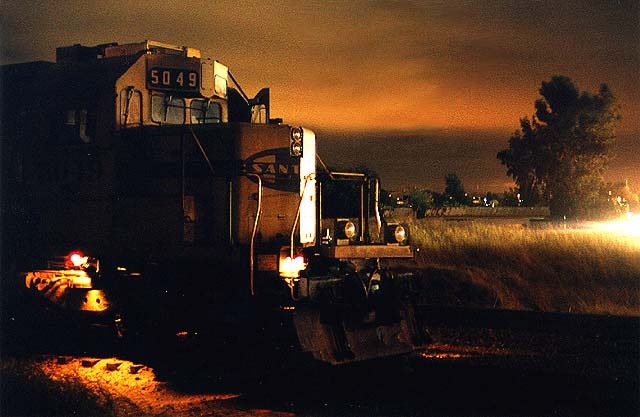 That may sound pretty obvious, but when it comes to railfan photography most of us set aside the cameras once the sun sinks below the horizon, figuring it is pointless or too difficult to take good photos in the dark. There is some truth to that, particularly if one hasn't had much practice shooting in low-light conditions or lacks the photography equipment to make night shots possible. Although I don't claim to be an expert on night shots, I have discovered them to be fun and challenging. It is exciting being able to capture on film something that you would otherwise be unable to see with your unaided eye. Below are a few of my early attempts. 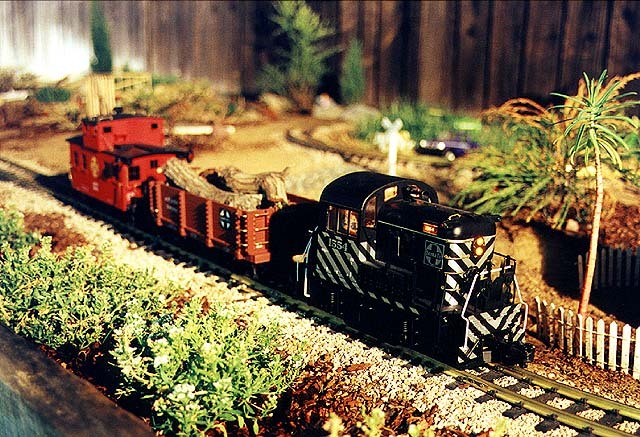 Some of them have been enhanced in Photoshop and include scenes from both the real railroads and our scale ones. There's nothing like a full moon in an early evening summer sky. 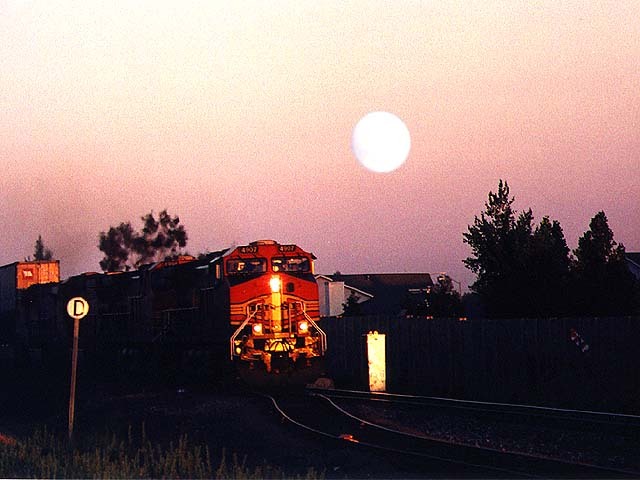 It is September 1999 and I have ascended the viewing platform on my back fence near dusk for a shot of BNSF 4907 west when I notice a brilliant moon high overhead. This photo is unaltered, but I wish the moon had been lower on the horizon. Photo by Glenn Gehlke. Who says you can't promise the moon? Thanks to Photoshop, I was able to bring that shimmering orb down to Earth where it should have been. Although this scene was faked, I have seen some awesome moonscapes along these tracks. One day I will have my camera ready when the moon is an eerie orange and appears twice life size. Photo by Glenn Gehlke. 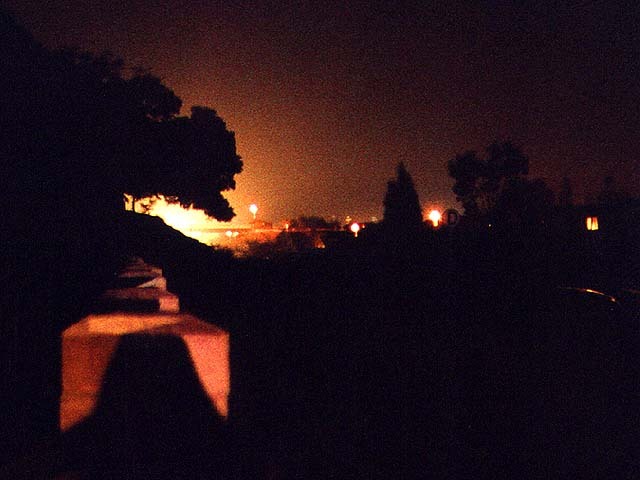 One evening in June 1999 I heard quite a bit of activity at the nearby Du Pont yard. When I climbed up the fence to investigate, there was Santa Fe 5049, an SD40-2U, idling on the yard lead. I used a 30-second exposure and around f4.5 to take the shot. However, most of the real work was done in Photoshop, where I pumped up the brightness and contrast and eliminated an annoying utility pole that found its way into my photo. I had to alter the sky a bit to cover my tracks. Photo by Glenn Gehlke. Here is what you get when you leave the shutter open as the crossing gates fall and the train enters the grade. 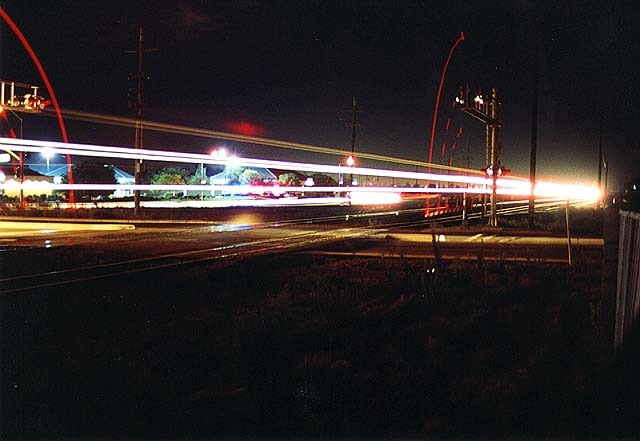 This shot -- about a minute in duration -- of an eastbound BNSF trailer train approaching the Big Break Road grade crossing in Oakley was taken Sept. 7, 1999. Photo by Glenn Gehlke. There is something haunting about seeing the glow of the headlight of an approaching train but not being able to see the train attached to it. 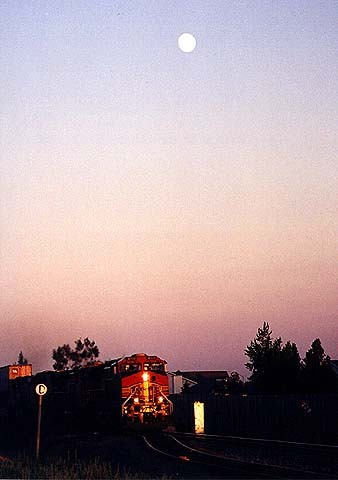 A westbound freight train silhouettes a large oak tree as it waits to depart Oakley after the arrival of the eastbound pictured in image #4. Photo by Glenn Gehlke. 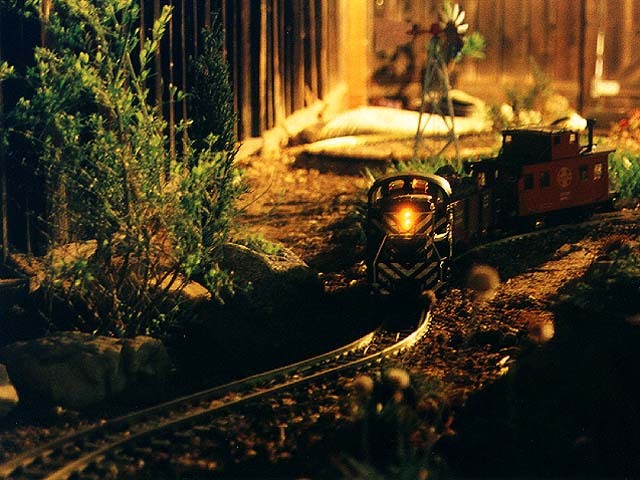 We switch now from the 1:1 scale to 1:29 scale for a few night scenes taken on our garden railway in October 1999. This is a time-lapse image of our Aristo-Craft Critter switcher making its way around the circuit outside our kitchen window. This was shot using a 28-80mm zoom at f3.5 for approximately 2 minutes. Although I was using a tripod I still managed to shake a bit, so there is some blur to this image. I'll make another attempt some day. Photo by Glenn Gehlke. 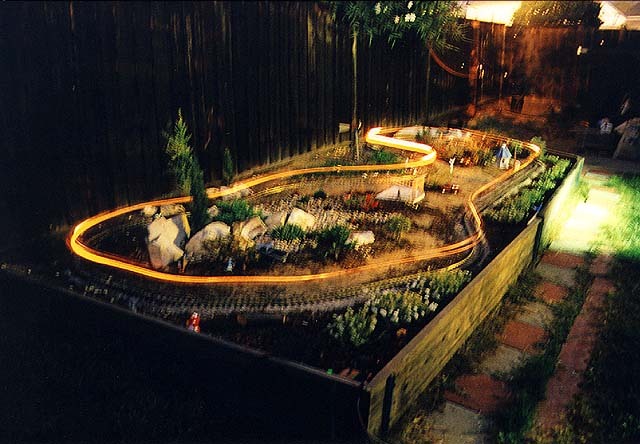 What happens when you over-expose a timed exposure at night? It looks almost like day. Here the lighting is just about right to make it look like late afternoon. This was shot at a low aperture at roughly ground level. Photo by Glenn Gehlke. Now here's one I sort of like. The headlight reflects off the rails as Santa Fe Critter 1554 eases into Big Rock canyon amid a landscape of broom and armeria. Photo by Glenn Gehlke. Back to the real thing. 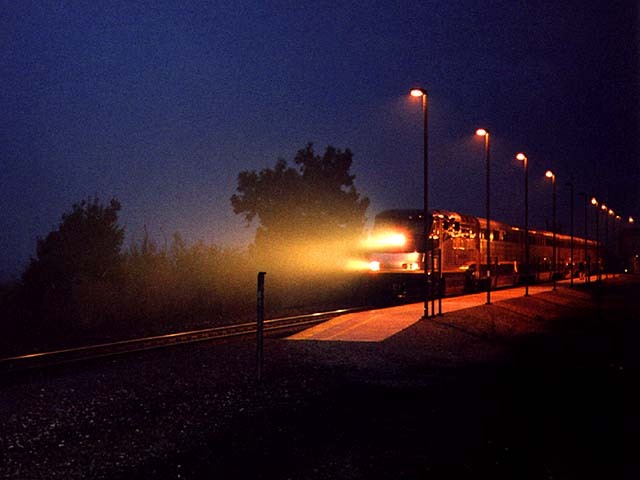 It's January 1999 and the headlights of Amtrak 2004 pierce the fog of an early winter's night as San Joaquin Train 715 takes on passengers at the Antioch depot. I had a few minutes to kill while waiting for some film to be processed at Costco, so I drove over to the station where I was lucky enough to get this shot. Photo by Glenn Gehlke. This page was last updated Tuesday, November 16, 1999 at 00:15 hrs.